Concerns are being raised over ties between George Soros, a billionaire and political activist with deep ties to Hillary Clinton, and an electronic voting company with machines in 16 states. The chairman of the London-based company, Smartmatic International, is Lord Mark Malloch-Brown, who also works under Soros. Malloch-Brown is on the board of the Open Society Foundations, run by Soros. His brief biography on the Smartmatic website says he was also formerly the vice chairman of Soros’s Investment Funds and of Soros’s Open Society Foundations. In the five days up to Oct. 26, a White House petition that calls on Congress to hold an emergency session about removing the Smartmatic voting machines received more than 71,000 signatures. The report also notes that electronic voting machine companies do not perform extensive background checks for employees, contractors, or interns. “Any employee, contractor, or intern could be an insider threat capable of altering the hardware, firmware, or software of e-voting systems,” the report states. 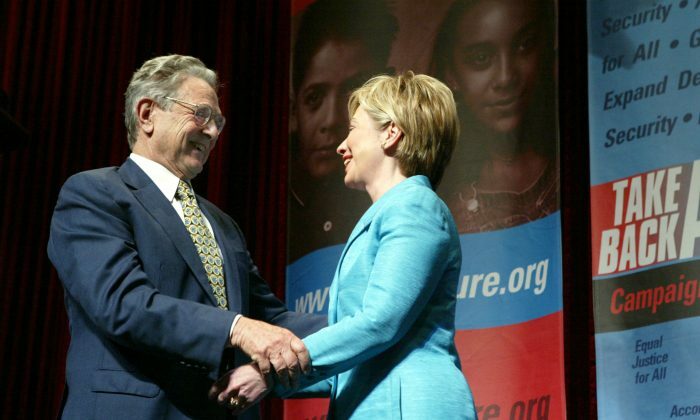 Soros has a long history of financing left-wing organizations, and according to Politico, has provided close to $25 million to super PACs and other organizations that support Clinton and her campaign. Soros is also known for making large donations to push his political goals. The Denver Post reported on Oct. 12 that Soros is “pumping hundreds of thousands of dollars” into a negative ad campaign against incumbent District Attorney Pete Weir, a Republican, in the race for one of Colorado’s 22 districts. Smartmatic provides technology for governments around the world used in smart cities, public records, and electronic voting systems. According to its website, it has offered technology and services to electoral commissions in 307 U.S. counties in 16 states. These include swing states like Arizona, Florida, Pennsylvania, and Wisconsin, which could determine the outcome of the election.